The betting possibilities in this game are pretty similar to the possibilities Net Entertainment slots offer. In the bottom left corner of the slot, you can configure the bet level. To the right of this, you can alter the coin value. And if you want to play this game without having to constantly press the spin button, you might want to check out the autospin mode. With this autospin engaged, the slot spins and places bets for you automatically. Another reason why this slot is so easy to play is the fact that all animations will appear on your reels hidden in boxes. Only once a winning combination has formed will the involving animations get revealed. At the same time, you will be shown your win. The pay lines work in both directions, so make sure to be aware of that. 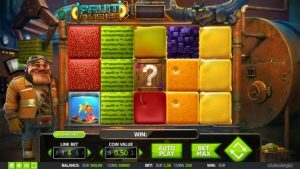 Fruit Smasher is an extraordinary slot by software developer Stakelogic. The creator of the game has decided to keep the layout of the game standard, but the slot packs more than enough interesting elements to make it a very exciting one. It has five reels and three rows, but the turning wheels do not behave as you might be used to. Also, the surroundings of the slot have been given a lot of attention, giving the slot a polished look. The maximum potential win in this game is a 50.000 coin win. Another maximum is the 50 free spins you can maximally win. Besides this, the slot is also equipped with a wild symbol that will bring forth more and bigger wins. 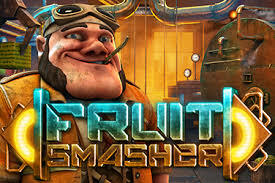 How to play Fruit Smasher? The betting possibilities in this game are pretty similar to the possibilities Net Entertainment slots offer. In the bottom left corner of the slot, you can configure the bet level. To the right of this, you can alter the coin value. And if you want to play this game without having to constantly press the spin button, you might want to check out the autospin mode. With this autospin engaged, the slot spins and places bets for you automatically. Another reason why this slot is so easy to play is the fact that all animations will appear on your reels hidden in boxes. Only once a winning combination has formed will the involving animations get revealed. At the same time, you will be shown your win. The pay lines work in both directions, so make sure to be aware of that. Fruit Smasher is equipped with a bonus game and in order to unlock this bonus game, you will need fish. Three fish bowls unlock a total of 10 free spins, and the maximum number of free spins you can unlock is 50. Free spins are spun on the same reels as spins during the base game. There are some important differences when it comes to what can happen on your reels. 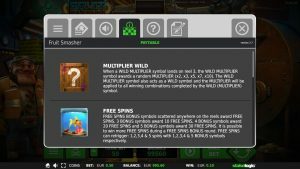 During free spins, wild symbols will not disappear with the next spin. Rather, wild symbols will move one position down with every spin, until they fall off the playing grid. This means that wilds stay on your reels longer, thus allowing them more time to win for you. Another feature that can prove lucrative is the one connected to the question mark symbol that can only show up on the middle reel. Below this symbol, there will be a multiplier that multiplies the wins. And this multiplier can get pretty large, and thus so can your wins! Fruit Smasher is not equipped with a jackpot, but, luckily, this slot won’t fail to amaze because of its awesome features and free spins. In total, the playing grid is fitted with 10 pay lines. And even though that might sound like a small number, you won’t need any more of them. That is, the 10 pay lines all work in two directions; from the left to the right and vice versa. Therefore, in practice, you will be playing with 20 active pay lines. And even though you will win frequently when playing this game, you will probably mainly focus on the way this game plays, as Stakelogic has managed to pull off something unique here. On the other hand, it still plays the same, it’s just the boxes that are really different. Still, it does seem to do the trick and with that, this slot might eventually turn out a big success.